An intermediate-range gunshot wound is one in which the muzzle of the weapon is held away from the body at the time of discharge yet is sufficiently close so that powder grains expelled from the muzzle along with the bullet produce "powder tattooing" of the skin (Figure 4.7). These markings are the sine qua non of intermediate-range gunshot wounds. Just as there is a gradual transition from loose-contact to near-contact wounds, there is also a gradual transition from near-contact to intermediate wounds. The powder grains emerging from the muzzle may be deposited in the seared zone around near-contact wounds though individual tattoo marks are not seen. As soon as one sees individual tattoo marks, one is dealing with an intermediate-range wound. For handguns, powder tattooing begins at a muzzle-to-target distance of approximately 10 mm. Tattooing consists of numerous reddish-brown to orange-red punctate lesions surrounding the wound of entrance. The distribution around the entrance site may be either symmetric or eccentric, depending on the angle of the gun to the target at the time of discharge, the nature of the target (flat or angled), and any covering of the skin, e.g., hair or clothing which may prevent powder grains from reaching the skin. When the muzzle of the weapon is at an angle to the skin, the skin under the muzzle, i.e., on the same side as the barrel, will show denser tattooing than the skin on the other side of the entrance hole (Figure 4.8). Figure 4.7 Powder tattooing of skin due to flake (disk) powder. Figure 4.8 Intermediate-range gunshot wound with muzzle of weapon at angle to skin. Powder tattooing of skin on same side as barrel. Arrow indicates direction of bullet. Powder tattooing is an antemortem phenomenon and indicates that the individual was alive at the time they were shot. 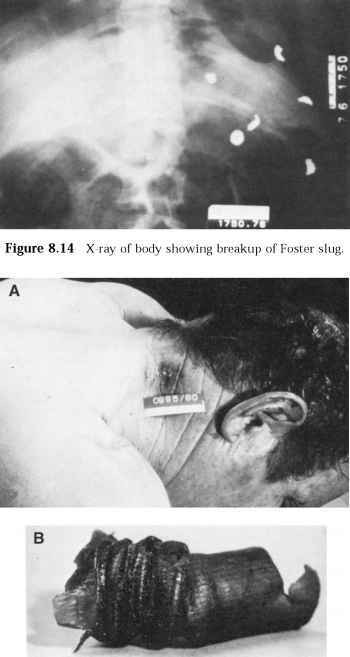 If the individual was dead before being shot, although the powder may produce marks on the skin, these marks have a moist gray or yellow appearance rather than the reddish-brown to orange-red coloration of an antemortem wound. There should be no difficulty with differentiating the two. Powder tattoo marks are produced by the impact of powder grains on the skin. They are not "powder burns", but rather are punctate abrasions. Similar markings can be produced by noncombustible particles such as polyethylene granules. The term "powder burns" should never be used because one does not know to what phenomenon the term is being applied. Some individuals use the term "powder burns" to signify powder tattooing, whereas others use it to signify searing and blackening of the skin due to the hot gases that occur from combustion of the propellant. The term "powder burns" dates back to the black powder era, when burning grains of black powder emerging from the muzzle, were deposited on the skin and clothing, where they smoldered, apparently producing actual burns on the skin. Black powder grains could also penetrate into the dermis and produce literal tattooing. The burning grains of black powder were capable of setting clothing on fire, a characteristic not possessed by smokeless powder. Some authorities use the term "stippling" synonymously with "powder tattooing." 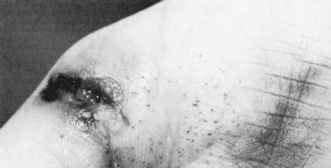 The author prefers to use the term "stippling" in a more generic manner to indicate punctate abrasions of the skin, which while they may be due to powder, may also be due to other materials, e.g., shotgun filler, fragments of intermediary targets. In other words "powder tattooing" is just one form of stippling with the term "powder tattooing" used to refer to stippling unquestionably and exclusively due to powder grains. If the marks are due to material other than powder or if one is not certain of their origin, then, one uses the term "stippling." The punctate abrasions of powder tattooing cannot be wiped away. Powder tattoo marks usually heal completely if the individual survives. This is logical, as the injuries are generally confined to the superficial layers of the epidermis. Grains of ball powder, and less commonly flake powder, however, may penetrate into the upper dermis thus producing actual tattooing of the skin. The author has never seen true powder tattooing of the palms or soles of the feet caused by powder emerging from the muzzle of a handgun though he has seen cases in which powder grains were embedded in the palms without any vital reaction (Figure 4.9). It is probable that the thickness of the stratum corneum in this area protects the dermis from any trauma — direct or indirect — arising from the impact of powder grains; thus there is no dermal vital reaction and, therefore, no true tattooing. Figure 4.9 Intermediate-range gunshot wound of palm with entrance at base of thumb, soot on thenar eminence and powder grains embedded in skin of palm. No true powder tattooing present. As the range from the muzzle to the target increases, the size of the zone of powder soot blackening will increase, whereas the density will decrease. Beyond a certain point, however, the overall dimensions of the powder soot pattern will begin to decrease, and it will be impossible to delineate exactly the outer border of the soot, as it has become so faint. The propellant is a determinant as to the amount of powder soot present in that some powders burn more cleanly than others. Thus, in a test using a .22-caliber revolver with a 6-in. barrel, two forms of .22 Long Rifle ammunition were fired at white cotton cloth. One form of ammunition was loaded with flake powder; the other with ball powder. The cartridge loaded with flake powder deposited powder soot out to a maximum of 30 cm, whereas soot from the ball powder disappeared between 20 cm and 25 cm. Powder loaded in Federal centerfire cartridges seems to be "dirtier" than that of other American manufacturers. Differences in the barrel length of a weapon may affect the amount of soot reaching the target. Thus, Remington 158-gr. .38 Special cartridges loaded with flake powder were fired at white cotton cloth. A 6-in. barrel weapon produced soot out to a maximum of 30 cm; a 4-in. barrel weapon to 25 cm; and a 2-in. barrel weapon, out to 20 cm. The longer barreled weapons produced a soot pattern that was smaller and denser. 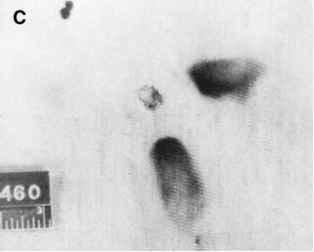 On the basis of the author's experience, the maximum distance out to which powder soot deposition occurs for most handguns is 20 to 30 cm. The orientation of the muzzle of the weapon to the target will determine whether the soot deposit around the wound of entrance in the skin or clothing is symmetric (concentric) or eccentric. If the muzzle is at a 90-degree angle to the target, the soot pattern should be circular in shape, with the entrance hole in the center. At ranges from loose contact up to 1 to 2 cm, there is usually a circular area of extremely dense dark-black powder blackening (soot) surrounded by a zone of light gray powder soot. Beyond this range (1 to 2 cm), one begins to get the blossom or petal pattern described by Barnes and Helson.2 As the range increases farther, this pattern increases in diameter, reaches a maximum size, and then gradually begins to shrink and fade, disappearing by 15 to 25 cm of range. In some instances, the classical petal or blossom pattern will not be present; rather, there will be a dense black center surrounded by a lighter gray outer zone, with this zone possibly having a scalloped appearance. Not uncommonly, a gunshot wound is covered with blood — wet, dried, or caked. In the process of cleaning the blood off the wound, soot may be wiped off. There are two methods of removing the blood without removing the soot. The first and simplest is to direct a spray of hot water at the wound. After a time, the water will wash away the blood but leave the soot. Blood can also be removed by pouring hydrogen peroxide on it. This will dissolve the blood, breaking up any clots. Any residual blood can then be washed away with a spray of water. Use of a hot water spray is sufficient in most cases. The hydrogen peroxide is useful when there are adherent clots of blood that will not wash away. Figure 4.10 (A) V-shaped deposit of soot from cylinder gap; (B) L-shaped deposit of soot on skin from cylinder-barrel gap. clothing is 100% synthetic, the hot gas may burn completely through the material with formation of the soot pattern on the underlying skin. If a gun is held at an acute angle to the body, there will be a deposit of soot, possibly associated with a zone of searing, from the cylinder gap as well as searing and soot at the entrance from gas emerging from the muzzle. Measurements from the cylinder mark to the entrance will give an approximation of the barrel length (Figure 4.11). Figure 4.11 Angled near-contact gunshot wound through blue jeans. The arrows indicate (A) a strip of seared material due to the hot gases from the cylinder-barrel gap and (B) the point of entrance of the bullet seared by the hot muzzle gases. The distance between these two points indicates the weapon was a short barrel revolver. In addition to the soot, powder escaping from the cylinder gap may produce tattooing of the skin. This tattooing will be relatively sparse. If the cylinder of the revolver is out of alignment with the barrel, as the bullet jumps from the cylinder to the barrel, fragments of metal may be sheared off the bullet. These fragments can produce marks (stippling) on the skin that resemble powder tattoo marks. Such marks, however, are larger, more irregular, and more hemorrhagic than traditional powder tattoo marks. In addition, fragments of lead are often seen embedded in the skin at these marks. These fragment wounds (stippling, pseudo-tattooing) often are intermingled with the true powder tattooing produced by powder escaping from the cylinder gap (see Figure 5.18). A silencer is a device for diminishing the sound of a discharging firearm. No silencer is completely effective and some individuals prefer the term "sound suppressor" for these devices. One can not practically silence a revolver because the noise of discharge exits the cylinder gap as well as the muzzle. Thus, silenced weapons are either semi-automatic pistols or rifles. The noise created on firing a weapon originates from the fall of the hammer or firing pin; detonation of the primer; the wave of gas and air exiting the barrel before the bullet; the bullet exiting; the propellant gas wave and the operation of the gun mechanism as the fired case is extracted and ejected and a new round chambered. This last noise may be deleted by locking closed the action of the weapon so that ejection and chambering of a new round is done manually. Firing a .22 Long Rifle cartridge produces approximately 150 decibels; a 9mm Parabellum cartridge 165 decibels. Silencers may be either an integral part of a weapon or attached to the muzzle. Most silencers are cylindrical devices attached to the muzzle of a gun. The cylinder is typically filled with metal or rubber baffles (disks) with a central hole through which the bullet can pass. In crude silencers, the cylinder may be stuffed with steel wool or fiberglass. The noise produced on firing a weapon is only partly due to discharge. If the bullet travels faster than the speed of sound, e.g., the 9-mm Parabellum, it produces a sonic wave that may equal the sound of discharge. The way to prevent such a noise is to use: a weapon chambered for a subsonic cartridge, e.g., the .45 ACP; a subsonic loading of a high-velocity round, e.g., the 147 gr. 9-mm Parabellum cartridge or to alter the weapon so that on firing supersonic ammunition, the bullet is subsonic on exiting the muzzle.3 This last solution is accomplished by drilling multiple holes down the barrel so as to bleed off some of the propellant gas causing the bullet to be traveling at subsonic velocity when it exits. A silencer may filter out most if not all of the soot and powder that emerges from the barrel. Missliwetz et al. noted an absence not only of soot, powder, and tattooing in a series of close-range wounds inflicted with silenced weapons, but also absence of the abrasion ring in some entrances.4 The weapons used were .32 ACP pistols and a 9-mm submachine gun. It is probable that the absence of the abrasion ring was due to the nature of the bullets rather than the fact that the weapons were silenced. The author has noticed an occasional absence of the abrasion ring in entrance wounds due to jacketed and semi-jacketed bullets. Silencers are rarely encountered. More common are muzzle-brakes and compensators. Just as in a silencer, they may be integral with the barrel or attached to the muzzle. A muzzle brake works by re-directing some of the gases at the muzzle so as to generate a forward thrust on the muzzle countering the force of recoil, i.e., reducing recoil. A compensator diverts gas upward to counteract the tendency for the muzzle to rise on firing. The terms muzzle brake and compensator are often used interchangeably. Muzzle brakes often function as compensators as well. In their simplest form, they consist of gas ports cut in the muzzle end of the barrel. 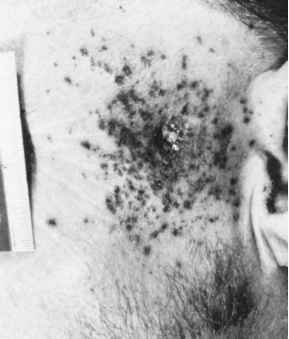 In some contact wounds, the jets of gas escaping out the ports may produce characteristic soot patterns on the skin or clothing. Figure 4.12A shows a contact wound under the jaw from a 7-mm Magnum rifle equipped with a muzzle brake (Figure 4.12B). 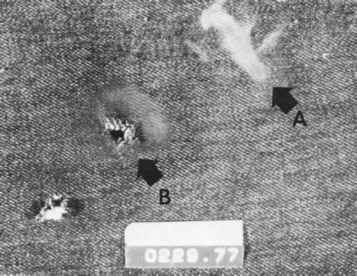 Figure 4.12C shows a "rabbit-ear" pattern produced by a .22-caliber target pistol with a compensator having two slits. Modern military rifles and some civilian rifles have flash suppressors attached to the muzzle. These devices are intended to break up the "fireball" that emerges from the muzzle of the rifle when fired at night. Such a device is useful in combat to decrease the possibility of counterfire. Flash suppressors generally consist of a cylinder, having a number of longitudinal slits along its length, that is attached to the muzzle of the weapon (Figure 4.13A). On firing, the gas emerging from the muzzle is bled out the slits rather than emerging as one large cloud. Soot is present in this cloud of gas. If the muzzle of such a weapon is held in contact with the body, the flash suppressor will produce a distinctive pattern of seared, blackened zones around the entrance. 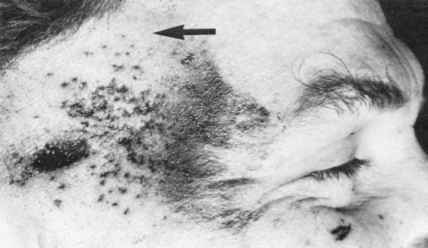 If fully formed, this results in an unusual flower-like pattern of soot and seared skin (Figure 4.13B-C). The number of slits will determine the number of "petals" to the "flower" and may give one an idea of the type of weapon used. Thus, for the M-14 with five slits in the flash suppressor, there are five "petals" to the "flower" pattern. The flash suppressor on the M-16A1 and AR-15 rifles initially had three slits which was changed to six slits. The M-16A2 and AR-15A2 have a suppressor with five slits with absence of the slit at the 6 o'clock position. The skin underlying these linear deposits of soot is seared, with the soot often being baked into the skin. 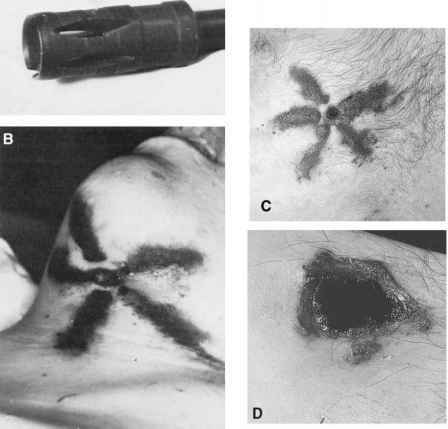 The "flower" pattern of the suppressor is more prominent when the wound is in an area of the body with loose skin that can enclose the suppressor (Figure 4.13B). In contact wounds on flat surfaces, the pattern may be more subtle (Figure 4.13D). 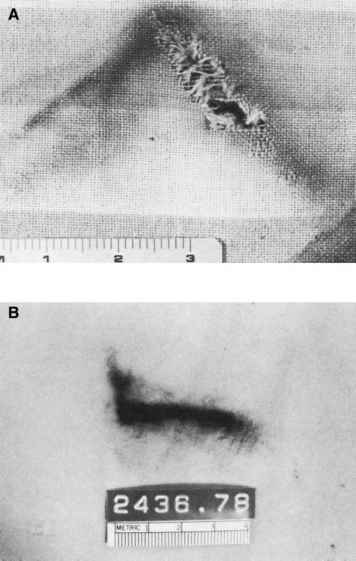 Figure 4.12 (A) Contact wound under jaw with muzzle imprint; seared zone of skin below entrance from (B) muzzle break. (C) "rabbit ear" pattern of soot on T-shirt produced by .22-caliber target pistol with muzzle break at end. Two slits on top of the muzzle break directed gas upward and forward, producing the soot pattern. Figure 4.13 (A) Flash suppressor. 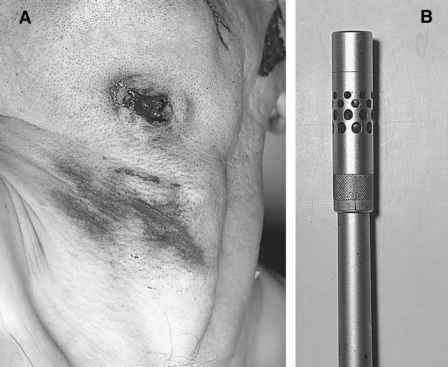 Flash suppressor burns on undersurface of chin (B) and chest (C) from M-14 rifle; (D) burns on chest from AK-47 suppressor. Winchester M 1400, there are two slots in the top of the forearm—one on each side of the barrel—through which soot-laden gas is vented. Knowledge of this arrangement was instrumental in the correct certification of the manner of death in a case seen by the author. The death was presented by the police agency as a case of suicide. The weapon was a Winchester M 1400 shotgun; the wound a near-contact wound of the forehead. There was a heavy deposit of soot and some fragments of tissue and blood on the left hand which had to have been holding the muzzle at the time of discharge (Figure 4.14A). On the palm of the right hand was a linear deposit of soot (Figure 4.14B). The only possible source for this soot was one of the vents. Thus, one hand was at the muzzle; the other partially overlying the vents on the top of the shotgun forearm. There was no way that the deceased could have pulled the trigger. The manner of death was certified as homicide. 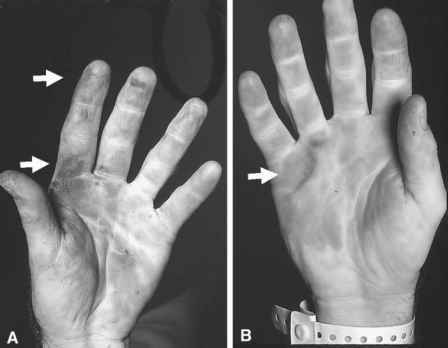 Figure 4.14 (A) Soot on left hand from muzzle and on right hand; (B) from gas port. An unusual powder pattern may be due to specific peculiarities of a gun. Thus, in the case illustrated, a 20-year-old Puerto Rican male shot himself twice in the chest (Figure 4.15A). The two contact wounds showed extensive blackening of the skin. Approximately 3.2 cm above each entrance wound there was a small, irregular area of powder soot deposit. The weapon used to inflict the wounds was a .22-caliber starter's pistol (Figure 4.15B) whose barrel had been reamed open. On the top of the barrel was a vent that was intended to channel off gases when blank cartridges were fired. When the two live rounds were fired; the vent in the weapon directed some of the gases in an upward and forward direction, causing the observed patterns. The two bullets recovered from the body were free of rifling.